Mini erbazzoni. Un aperitivo to begin with a toast! Welcome to the NY al dente kitchen! Let’s start with an aperitivo to celebrate the opening of this new blog with a toast! 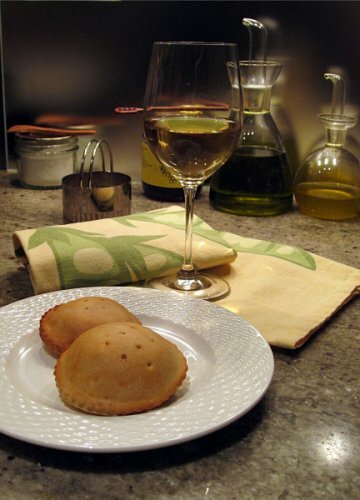 Grab a glass of wine and have a bite of these mini erbazzoni. 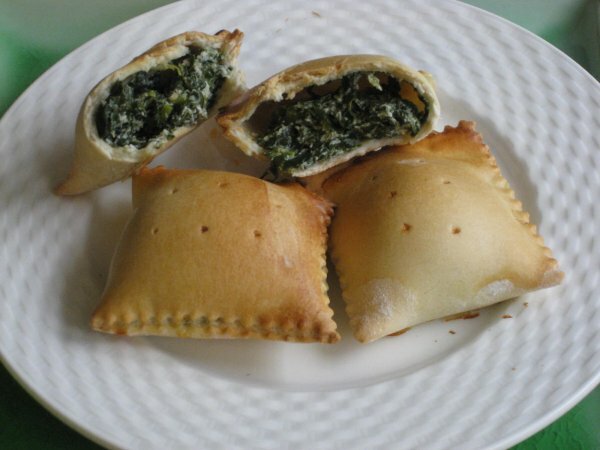 The erbazzone is a traditional Italian savory pie originally from Reggio Emilia with a filling basically made of swiss chard and/or spinach with plenty of Parmigiano-Reggiano. Made in a small size, they are excellent as an aperitivo, hors d’oeuvre, or even for a lunch box. It is a very versatile recipe, many filling variations and additions are possible, and by adding cheese, eggs, and/or meat such as pancetta, sausage, mortadella, or ham, it can easily become a nutrient dish for lunch or dinner. The traditional crust is a sort of pâte brisée (or shortcrust pastry) made with lard. I opted for an extra-virgin olive oil version of the crust and a simple filling with swiss chard and ricotta. Ingredients for the crust: 250 gr of all purpose flour, 1/2 tsp of baking powder, 30 gr of extra-virgin olive oil, 1/2 cup of cold sparkling water, 1/2 tsp of salt. Ingredients for the filling: 1 bunch of swiss chard, 1 small shallot, 1 clove of garlic, extra-virgin olive oil, 120 gr of ricotta, 60 gr of grated parmigiano, nutmeg, black pepper. Prepare the dough for the crust. Mix all the ingredients in a bowl, adding the water a bit at a time, until you to obtain a smooth dough. Use a electric mixer if you want. Finish by kneading the dough by hand on a flat surface. Try working as quickly as possible to prevent the dough becoming warm. Wrap the dough in clear plastic wrap and chill for a minimum of 15 minutes, up to 30 minutes. It is important to let the dough chill and rest, it will make it less difficult to roll it. Prepare the swiss chard for the filling. Chop the leaves in large pieces and put them in a pot with water. When water boils add salt and cook until tender. Drain and press to get rid of the excess water. Next you want to saute the vegetables with finely chopped shallot, garlic, and extra-virgin olive oil. Begin by softening the shallots in olive oil on a medium flames, together with a clove of garlic. I use a wok but a frying pan is also good. Add salt to taste and saute for a few minutes. Discard the garlic. Distribute on a cutting board and chop finely. Let it cool a bit. Prepare the filling. In a bowl mix the chopped vegetable, the grated parmigiano, the ricotta, some freshly grated nutmeg and black pepper. Make the pies. Start preheating the oven at 375° F. Roll the dough very thin about 3 or 4 mm (1/8 in). (If you wish use a pasta machine). Distribute the filling on the rolled dough. To help sealing, wet the dough around the filling with a bit of water. Then cover with a top layer of rolled dough and seal all around the filling pressing with your fingers paying attention to let out all the excess air. Cut the mini erbazzoni in the shape you like using a dough cutter or a wheel cutter. 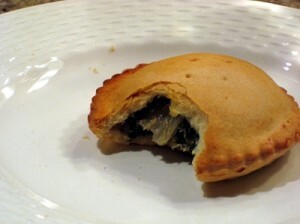 With a tooth pick make holes on the top of the mini pies. Bake. Cover a baking sheet with baking parchment paper, put the mini erbazzoni on it , brush them with some milk, and put them in the oven. Bake for 30 minutes, or until golden. Enjoy them. Let them cool down before eating them they are good either warm or room temperature. Still very good also the day after. This looks divine. I may have to start cooking for myself from now on. Yum! These look wonderful! I might have to try them this weekend – they are a lot like the torta di spinaci (torta d’erbe, torta di patate) that my family makes. Everyone in my family loves those, so I bet this will also be popular. Li ho provati: incantenvoli!!! NYAldente, se un giorno vorrai venire a cucinare a casa mia sarai il benvenuto!!! I finally made this. Boy, is it ever tasty. Everyone loved it.